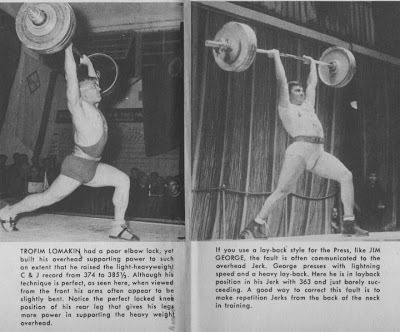 The Tight Tan Slacks of Dezso Ban: Overcoming Failures in the Jerk - "Joe Weider"
Overcoming Failures in the Jerk - "Joe Weider"
If you want to become a successful weightlifter you must be able to jerk more weight overhead than you can clean. 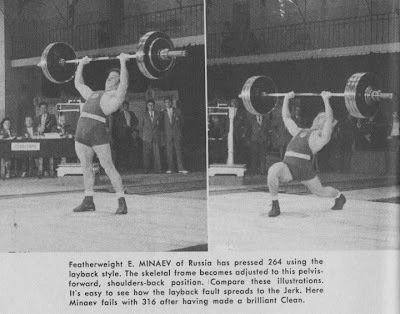 Indeed, if your limit clean and limit jerk are equal, then you jerk is inferior. That’s why Olympic lifting champions are champions. They followed a scientifically planned workout schedule to build a limit jerk 30 to 40 pounds more than their limit clean. Why should you jerk more weight overhead than you can clean? (1) When making a clean, it takes so much out of you. 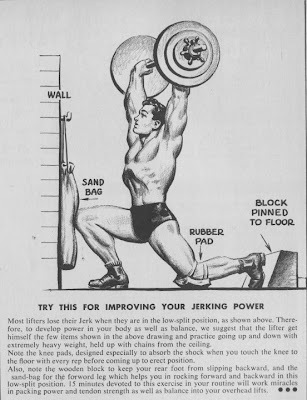 Unless you are a good jerker you often can’t complete the lift – even though you can jerk as much from the shoulder as you clean from the floor. 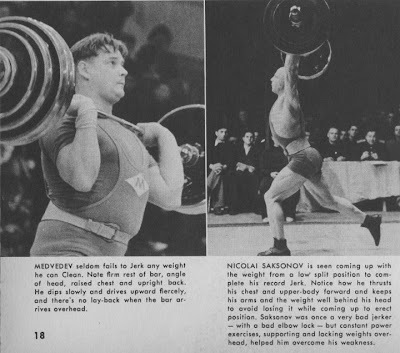 (2) Many lifters who can’t jerk much more than they can clean often lose the jerk at the end because they haven’t the power and technique to save the jerk. Therefore, as a reserve of strength and power is built into the jerk, many weak jerks can be saved. It is far easier to jerk more weight overhead than you can clean. Again, why? (1) When a clean is made the bar must be lifted upward from a very awkward position for a long distance. 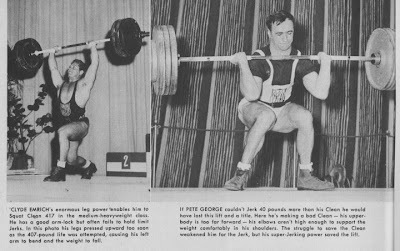 Even when the bar is fixed at the shoulders in the split or squat position the legs still have a tremendous feat of strength to perform – in coming up with the weight, balancing the body, and getting properly set. (2) When standing upright your body is in a very powerful position for the hips and thighs to drive the weight upward to the height required. 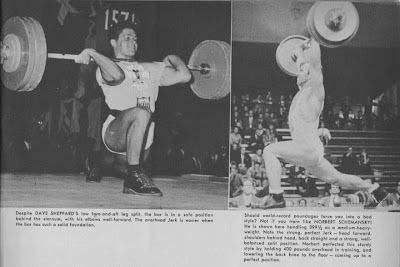 From that point it’s only a matter of speed, timing, coordination and direction to hold the weight overhead with elbows locked as the leg-split is made. Human bones will stand enormous pressure and there are many men who have supported 500 pounds overhead on one arm alone. That’s why the jerk is easier than the clean. It’s no use making a brilliant clean with a very heavy weight if you can’t be sure of finishing the lift by jerking it overhead. (1) Keep your elbows to the front so that the bar doesn’t roll down your chest when the knee dip and leg thrust are made. (2) Learn to support heavy weights at the shoulders. This can be done with the assistance of a rack, power stands or boxes. Adjust the means support to the exact height where you actually start to send the bar overhead from the shoulders. Place the barbell across the stands and load it with a far heavier weight than you’ve been accustomed to using. Now take the weight off the stands, onto your shoulders, and play around with it. Lift it slightly upward – just an inch of so to get it off the stands – and hold it for a few seconds, then lower it again to the stands. Next time try to hold it longer, continuing in this way to increase both the amount of weight on the bar and the length of time you can hold it. In this way you will build the extra tendon and ligament strength needed to make this part of the lift easier to do. (3) Train to support heavy weights at arms’ length overhead. Use the rack or stands for this too. Adjust the supports to your completed jerk height, place the barbell across them, and load it with a heavier than usual weight. Now again, just “inch” it upward and hold it as long as you can. Lower, and do it again, and again until tired. Continue in this way – holding heavier and heavier weight for a longer and longer time – to strengthen this part of your jerk. (4) Use stands or the rack set at various heights and, starting from the bottom, make partial or full recovery movements from the split position with heavy weights held overhead. (5) Occasionally load the bar unevenly and try to make complete jerks this way to improve general control. (6) Make power jerks without moving your feet – thrusting your head forward and your arms backward as the elbows move into their locked position. (7) Perform power-dip leg thrusts and try to drive heavy weights upward to at least the crown-of-head height, concentrating on keeping the weight in the right groove. Study the pictures illustrating this article. They’ll show you how errors and neglect of earlier training sessions lead to failure on limit attempts . . . and how some fabulous jerk successes were made.